Find either Lord Woodborne or his diary in the castle. This quest is the last in the Lysandus series. Having successfully finished it, you have completed half of the original mission given to you by Emperor Uriel VII. 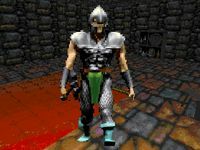 Having spoken to the ghost of King Lysandus, you learned that Lord Woodborne is the one who betrayed and struck down the King of Daggerfall. 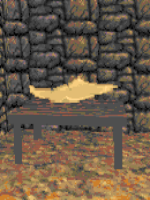 If you have already completed the Emperor's Letter series of quests through Orcish Treaty, you may be aware that Lord Woodborne is also rumored to be in possession of a certain item of interest. That item is not the object of this particular quest, however. 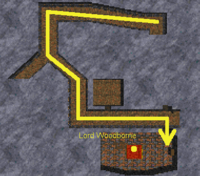 Woodborne Hall in the Kingdom of Wayrest will be marked on your map after speaking to the king's shade. When you are ready, travel there and head inside to exact ghostly vengeance. You start at the entrance hall of the castle. A couple of enemies will be waiting to welcome you — kill them. To proceed further, you must reach the very top of the hall. 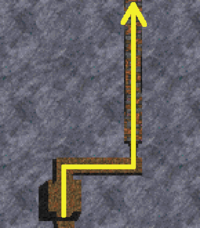 If you have a Levitate spell, you can proceed onward to the next section of the walkthrough. If you can't leviatate, you must first find a way to reach the top level. 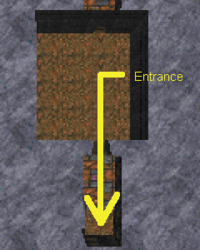 This can be done by pulling four levers which construct a ramp leading up to the top. You can pull these levers at will—they don't need to be pulled in a specific order. Jump down at the first level and go north from the elevator shaft. 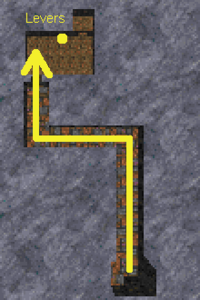 Follow the hallway until you reach a room with two levers. 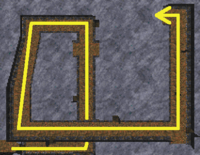 Pull the left one and the right lever will open a door to a small room containing two enemies. Go back to the elevator and take it to the top level. 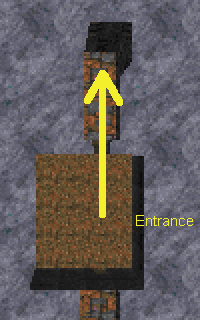 Now that the ramp is constructed, follow it up to the very top of the entrance hall and enter the main dungeon. Walk up the hallway until you reach a fork. Take the southeast fork and follow the hallway. Enter the first room to your right and you will find Lord Woodborne, who is a knight-class enemy. "You! You're that (player's race) (player's name). You have been a thorn in my side for a long time now. A wiser (player's race) would have let sleeping kings lie. Especially when I have gone to such great lengths to kill them. Yes (player's first name), I killed King Lysandus. And now it will be a pleasure to slay you. En garde!" "I am...done in. It is up...to...to Gothryd now. May you...rot in hell (player's name). I most...certainly shall." 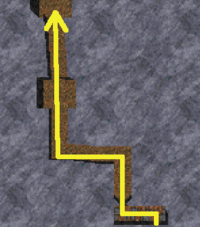 Backtrack to the dungeon entrance if you haven't set a Recall anchor there and seek out or await your next quest. 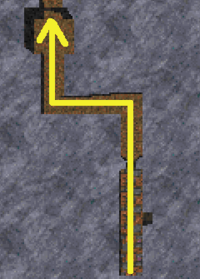 Follow the hallway east and watch out for enemies that are waiting in the rooms along the way. 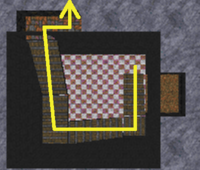 When you reach an elevator shaft, you will notice a wall blocking your way to the west. Just drop down the shaft and ride the elevator to the top. Ride it down again and the wall will be gone; however, if you go too far away from the shaft the wall will come up again. In this case you must take the elevator up and down again. Once the wall is gone, go into the room. Watch out for the two enemies there, usually a battlemage and a spellsword. Among some treasures, you will find a page of Lord Woodborne's diary. Grab it, and read it if you wish. the poison against Elysana, and especially, me. Barenziah doesn't trust me, this I can tell. I will deal with her just as I did with Lysandus. sub-humans once I sit upon the throne of Wayrest. First it is important to solidify my power base. Lord Woodborne's implicit admission that he was the assassin who slew King Lysandus. Woodborne is betrothed to Princess Elysana, and is plotting against King Eadwyre, Queen Barenziah, and Prince Helseth to usurp the throne of Wayrest upon the king's death. Lysandus was allied with Gortwog and the orcs, who tried to prevent his murder. Lysandus' son, King Gothryd, is allied with Lord Woodborne. Your goal is to use this information to choose an individual to deliver the diary page to; someone who can use it against Lord Woodborne, thus sealing his fate and avenging Lysandus' death. If this is properly accomplished by giving the page to one of the right people, you will see the video sequence of the king's spirit finding rest, as seen above. Delivering the page to the wrong people will prevent Lysandus' revenge at best, at worst you will be betrayed and attacked. Backtrack to the dungeon's entrance if you haven't set a recall anchor there, and seek out someone who can finish the task. The pool of potential recipients includes most of the major nobles and powers in the Iliac Bay region. The response (and any attendant reward) you receive depends on whom you choose to give Lord Woodborne's diary to. "This means little to me. It is trash fit only for being burnt. Gothryd and Woodborne plotting to kill Lysandus. Really! Go away." "Lord Woodborne is the slayer of my dear Lysandus. There shall be justice, and it shall come from my hand! You would do best to stay clear of Woodborne Hall and Wayrest for some time (player's name)." "This is atrocious! After all the affection we showered on that fool Woodborne! We nearly married that villianous [sic] swine to Elysana -- nearly handed the throne of Wayrest to a cad of the first order! Good (player's first name), it was the right thing to do to bring this to our attention. Rest assured that Lord Woodborne will be arrested and executed for his treason, his name barred from the books of honor, his acquaintances interrogated, his fortune confiscated. As a gift, please allow me to give you (random gold) gold pieces as your share of his property confiscations." "This information is quite valuable (player's first name). Let me gift you with (random gold) gold for giving it to me. This will be quite handy in the coming conflict." "You were completely correct to bring this to me. Otherwise it might have gotten out where it could do Lord Woodborne damage. Guards! Kill this (player's race)!" In addition, giving the diary to Akorithi, Aubk-i, Gothryd, Gortwog or the King of Worms will NOT trigger the video sequence, as they are unwilling (or unable) to exact vengeance on Lord Woodborne. Therefore, to complete the quest you have to give it to one of these people: Barenziah, Eadwyre, Helseth, Medora, Mynisera, or Nulfaga. The start of the Totem quest is triggered from within this quest, but not before all three subplots of the Main Quest (finding the emperor's letter, helping the King of Worms acquire the lich's soul and avenging Lysandus' death) are completed successfully. Hence, it is theoretically possible to kill Lord Woodborne and get the reward by handing over the diary if at least one of the two other subplots has not yet been completed. DFQFIX addresses both of these issues; you will now properly receive your reward from any of these NPCs. "There were some strange men here asking about a (player's race) named (player's name)." "Didn't like the look of those thugs. Thank (random god) they moved on." "The stars foretell dreams that will never come true." "There are dangerous portents the oracles of (region) have foreseen." "I hear things are getting kind of rocky in Wayrest." "I heard that they found the body of King Lysandus!" "I hear Lord Woodborne was beheaded for treason." "They caught Lord Woodborne and tried him for treason." "I heard a flock of Daedra descended upon Lord Woodborne and carried him off." "Things from beyond the grave rose assaulted Woodborne Hall!" "I hear Lord Woodborne cheated the Mages Guild. They sent demons kill him." "I heard that Lord Woodborne will be marrying Princess Elysana." "Lord Woodborne is in high favor these days at Castle Wayrest." 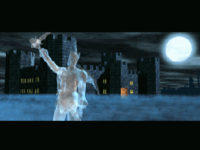 0 (Date): Lysandus' ghost appeared to me and told me that only the death or humiliation of his murderer, Lord Woodborne, would lay his soul to rest. Lord Woodborne is a noble of Wayrest and betrothed to Princess Elysana. He has a castle in the wilderness of Wayrest. 1 (Date): I found a most damning couple of pages in Woodborne Hall. I'm sure Lord Woodborne would be quite livid if they were to fall into the wrong hands.